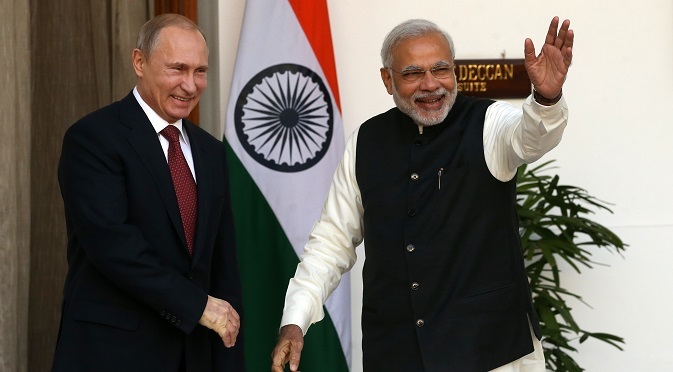 Narendra Modi will meet Vladimir Putin for the annual India-Russia summit in Moscow this week. During Narendra Modi’s visit to Moscow this week, Russia and India are likely to sign contracts for the sale of S-400 Triumph surface-to-air systems, Project 636 Varshavyanka diesel-electric submarines, Project 11356 frigates, and Mi-17V5 military-transport helicopters. India and Russia may sign a series of defense contracts when Indian Prime Minister Narendra Modi visits Moscow this week, Kommersant reported on Dec. 21. “The total value of the contracts is estimated at over $7 billion,” the newspaper said. Before the visit, the Indian government's committee on procurement approved the allocation of funding to buy S-400 Triumph surface-to-air systems. “Several top managers of Russian defense enterprises have confirmed to Kommersant that India may buy at least five divisions of S-400 systems, thus becoming the second largest customer of the system after China. However, a source in a Russian defense enterprise told Kommersant the negotiations on the S-400 systems will not be easy as the Russian price of five divisions of S-400 systems, which is some $2.5 billion, does not suit India,” the report says. The paper reported that the negotiations would also address agreements on the purchase of two Project 636 Varshavyanka diesel-electric submarines, three Project 11356 frigates, and 48 Mi-17V5 military-transport helicopters. “Negotiations are being conducted on the purchase of some 150 combat infantry vehicles BMP-2K, and also the modernization of the Il-78 and Il-76 fleet of the Indian Air Force. We are also expecting a decision on the leasing of the second Project 971 nuclear submarine,” the paper reported, citing a source close to the negotiations. “Another broadly discussed issue is the preparations for signing of an intergovernmental agreement on joint production in India of 200 multi-purpose helicopters Ka-226T. Russian Industry and Trade Minister Denis Manturov has already declared Moscow's readiness for the implementation of this project, which is in line with the tasks outlined in the Make in India strategic program initiated by Prime Minister Narendra Modi,” Kommersant reported. The report says India has been a leading importer of Russian military products for many years it is accounted for 28 percent of all imports (worth $4.7 billion) in 2014. The products purchased range from multi-purpose fighter planes Su-30MKI and deck-based MiG-29K/KUB to reactive salvo fire systems 9K58 Smerch. Additionally, the fifth generation plane (FGFA) is now being designed and licensed production of T-72 and T-90 series tanks has been launched. Indian media outlets have also reported that New Delhi and Moscow are finalizing a counter-terrorism framework.